Steel Aweigh is an upscale 10th floor Gulf Front condo with 10’ ceilings and stunning beach views. It has been completely renovated in a modern Industrial Chic / Nautical design. It’s Geek-Ready and Family/Friend/Pet friendly! There are 2 bedrooms and 2 baths. The baths have fully tiled showers, granite counters and high-end vanities and fixtures. The bedrooms and living areas feature custom artwork, large LED TVs and upscale furnishings from Restoration Hardware, Arhaus and custom pieces from an artisan who specializes in industrial design. The kitchen features granite countertops, new slate appliances, upscale gourmet baking amenities and classic white serve-ware. The design elements will make you feel as if you’ve just stepped into a seaside oil-punk condo - it’s definitely not your grandma’s beach cottage! Leeward Key is a highly desired, pet friendly, 12 story condo building with stunning Gulf views and a private beach. 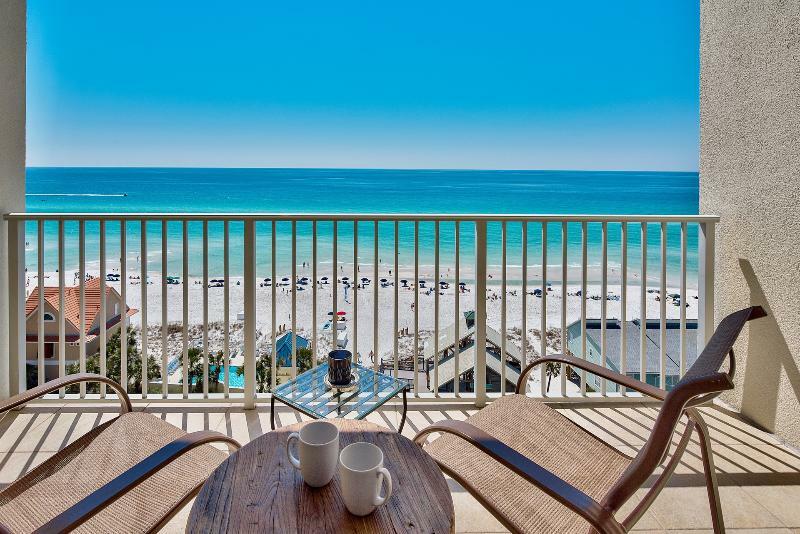 It is one of the few Destin area properties with a pool right on the beach. The (seasonally-heated) pool has restrooms, outdoor showers and wifi. There’s an additional pool on the north side of the condo building, which has outdoor gas BBQ grills. Leeward Key also has an onsite Fitness Facility and snack/DVD vending machines, and 2 elevators servicing its 12 floors. - Free (seasonal) beach setup service: 2 chairs and an umbrella - (a value of over $200/week). - Master Bedroom with King Bed, flatscreen TV, ensuite bath and view of the gulf. Sleeps 2. - Guest Bedroom with King Bed, flatscreen TV, ensuite bath (accessible from living area) Sleeps 2. - Living room with Queen sleeper sofa. Sleeps 2. - Pet friendly (fee applies) - pets under 25 lbs. - High end furnishings and custom designed artwork and furniture. Located on Florida's Emerald Coast, Destin is known for its white beaches and emerald green waters. Originating as a small fishing village, it is now a popular tourist destination. According to the Florida Department of Environmental Protection, over 80 percent of the Emerald Coast's 4.5 million visitors each year visit Destin. The city styles itself "The World's Luckiest Fishing Village" and claims to have the largest fishing vessel fleet in the state of Florida. It is recommended that you bring or rent a car. There are many places to visit and you will want that flexibility. We have a complete staff locally that is there to help with any issues if they arise. You will have their contact info in the home when you arrive.